Cambridge Plumbing 8162 72" Double Basin Sink with Porcelain Countertop, 68" x 22" x 36"
A double basin sink bathroom vanity that offers an abundance of storage room. This solid oak vanity is in the popular Espresso finish. There are two sets of storage doors and three drawers which have soft close hinges at no additional cost. 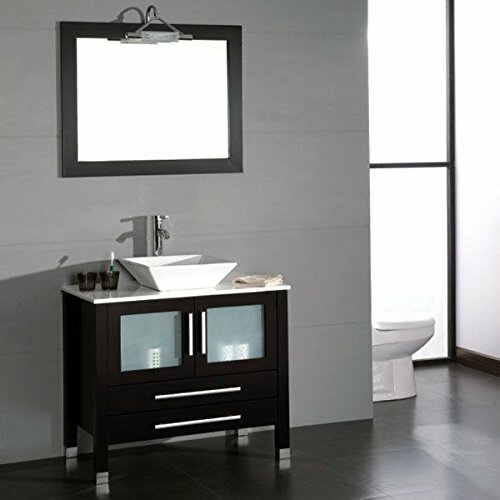 This complete bathroom vanity set includes two large wood trimmed mirrors, each with the same espresso finish as the vanity. A white porcelain counter top with two basin sinks to give the vanity a beautiful contesting appearance. AC21. Necessary tub valve body sold separately-reference the valve comparison chart to find the right valve body for your brushed nickel finish resists flaking and corroding for the lifetime of the faucet. Installs on 3-hole mount tubs or tub deck-tops. Cambridge Plumbing 8111-B 36" Solid Wood Glass Vessel Sink Set with a Polished Chrome Faucet, 36" x 21" x 34"
The vanity set comes complete with a dark Espresso cabinet with two soft close doors and two soft close drawers. A contemporary tempered glass counter top and vessel sink top off the modern look. Each door has a tempered glass insert. An oversized wood trimmed mirror compliments the vanity and is included, as well as all of the required plumbing fixtures for installation. The single stem faucet sets above the bowl sink and can be upgraded to brushed nickel or to a waterfall faucet. You will absolutely discover something to match your bath room ambiance. Complete Vanity Set Contains: Solid Oak Wood Vanity, Glass Vessel Sink, Faucet, Supply Lines, Drain & Mirror Solid Oak Wood Vanity Finish As Shown- Espresso (darkest brown) Cabinet Has 1 Double Door Storage Cabinet and 2 Drawers Brushed Chrome Cabinet Hardware Drawers and Doors Have Soft Close Hinges Vanity Measures: 35 1/2" Length and 25 1/2" Depth and 35 1/2" Height (From Floor to Top of Sink) Plumbing 1- Single Stem Faucet- Polished Chrome Faucet 1- Drain Assembly with P Trap- Polished Chrome ONLY 1- Set of Flexible Supply Lines SINK 1- Tempered Glass Vessel Sink Mirror 1- 34 3/4" x 27 1/2" with Hanging Bracket LIGHT NOT INCLUDED. 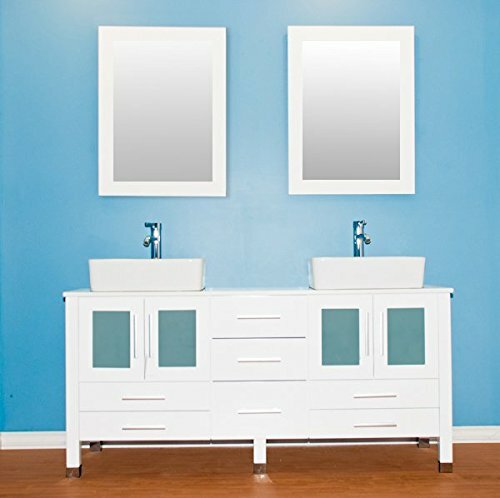 Cambridge Plumbing 8119w 63" Solid Wood Vanity with Frosted Glass Counter Top & Two Matching Vessel Sinks. Two Long-Stemmed Chrome Faucet, 64" x 19" x 29"
When you have plenty of space for the perfect piece of furniture, look at this vanity. This stunning double vessel sink vanity is made of solid oak wood and has been finished in snow white. The porcelain counter top and vessel sinks are durable and add a contemporary flare to this timeless piece of fine furniture. The cabinet provides maximum storage with seven drawers with soft close hinges at no added cost. 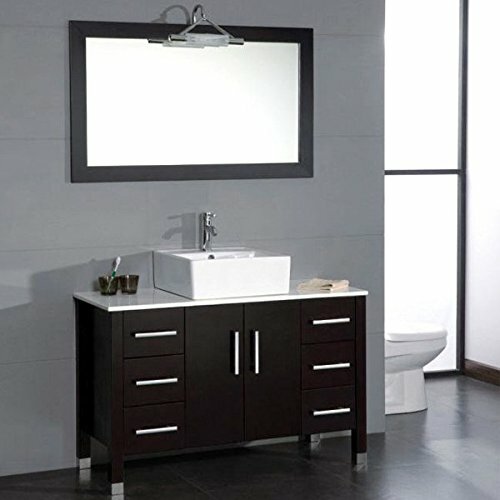 Wood trimmed mirrors, single stem chrome faucets and plumbing hardware is provided so the installation is quick and easy. 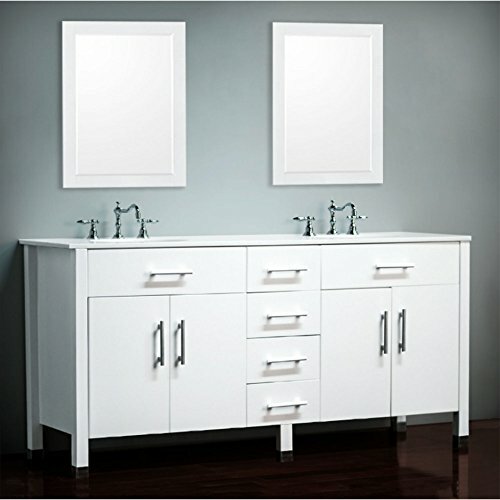 Solid wood vanity with frosted glass counter top and two matching vessel sinks. Two long-stemmed brushed nickel faucets included. Necessary tub valve body sold separately--reference the valve comparison chart to find the right valve body for your brushed nickel finish resists flaking and corroding for the lifetime of the faucet. Installs on 3-hole mount tubs or tub deck-tops. 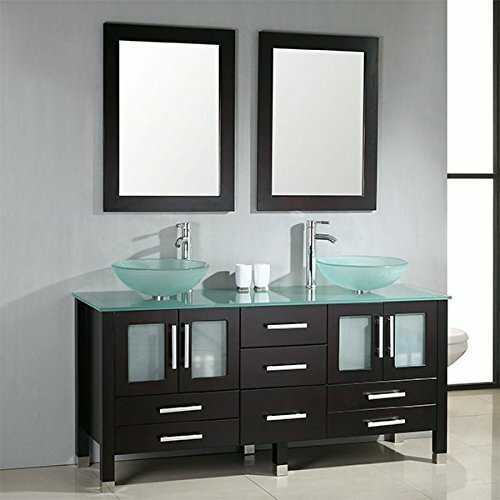 Cambridge Plumbing 8116-BN 48" Bathroom Vanity Set with a Brushed Nickel Faucet, 48" x 20" x 30"
This beautiful Espresso colored vanity set includes the solid wood cabinet with six roomy, pull-out drawers. Each of the six drawers have soft-close hinges included with no additional cost. The white porcelain counter top and over sized porcelain vessel sink adds an attractive contract to the dark coffee Espresso finish. 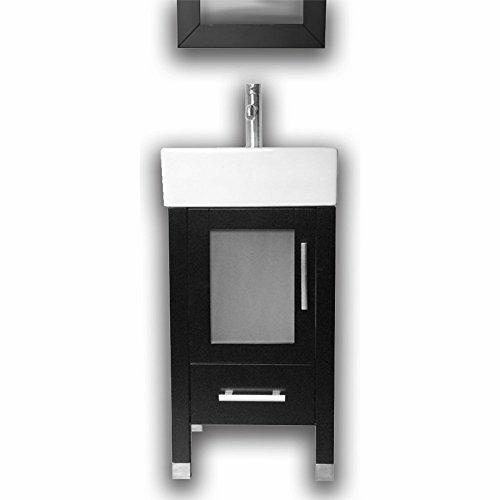 The door has a tempered glass panel as an added feature. There is a large white porcelain vessel sink and one chrome, one hole faucet. 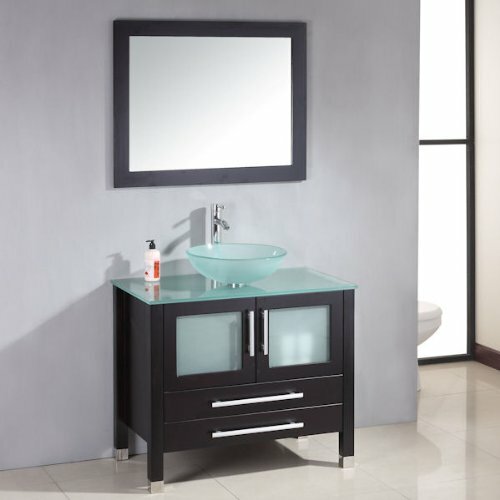 This complete bathroom vanity set includes a wood trimmed mirror with a mounting bracket. 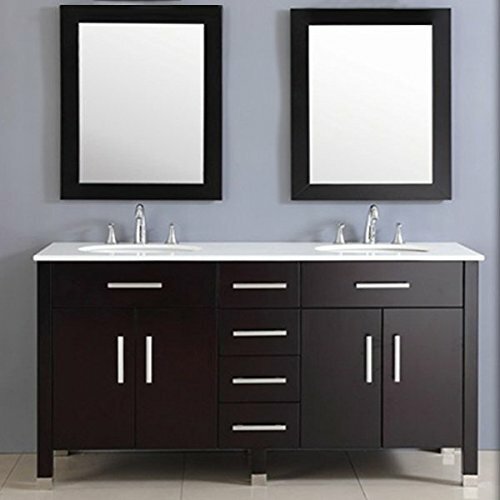 This vanity is a complete set which includes a solid wood Espresso colored cabinet, as well as a pristine white porcelain counter top with vessel sink and there is a matching wood trimmed mirror. The two doors and two drawers have soft close hinges. All of the Plumbing fixtures are included- single stem faucet. 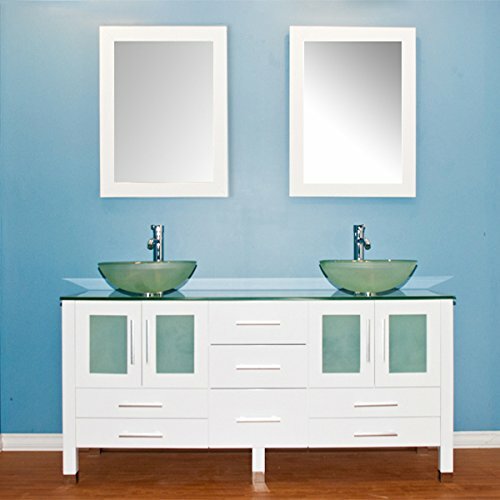 Compare prices on Cambridge Vanity at ShopPlanetUp.com – use promo codes and coupons for best offers and deals. We work hard to get you amazing deals and collect all available offers online and represent it in one place for the customers. Now our visitors can leverage benefits of big brands and heavy discounts available for that day and for famous brands.